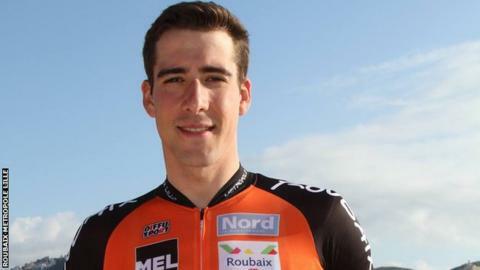 He is the second Belgian cyclist to die in as many days after Antoine Demoitie was struck by a motorbike during Belgium's Gent-Wevelgem race. His team, Roubaix Metropole Lille, said in a statement: "He lost his last race after fighting like a champion." He suffered the heart attack while in an ambulance, before being transferred by helicopter to hospital, where he was put on artificial respiration and fell into a coma. According to his team, Myngheer's organs have been donated. British cyclist Mark Cavendish tweeted: "Such a terribly sad few days in the professional cycling world. Another tragic loss. "RIP Daan Myngheer. My thoughts are with your loved ones." Team Sky added: "Our thoughts are with the family and friends of Daan Myngheer. So sad to lose another member of the cycling family." Welsh cyclist Owain Doull wrote: "Tragic news to wake up the death of Daan Myngheer. I've been racing against Daan since I was 15 and always looked up to him. Gone too soon." Tour de France organisers ASO, who also operate the Criterium International, said on Twitter: "Our deepest condolences go out to the families, friends and team-mates of Antoine Demoitie and Daan Myngheer." UCI president Brian Cookson wrote on social media: "My thoughts are with the family, friends and teammates of Daan Myngheer." The accident happened when several riders crashed as they passed through northern France during Sunday's Gent-Wevelgem one-day race. A minute's silence was held for both riders at the beginning of the Three Days of De Panne on Tuesday morning.